Hope some will be busy with New Year Celebrations and some will be busy in preparing some special food for this day. 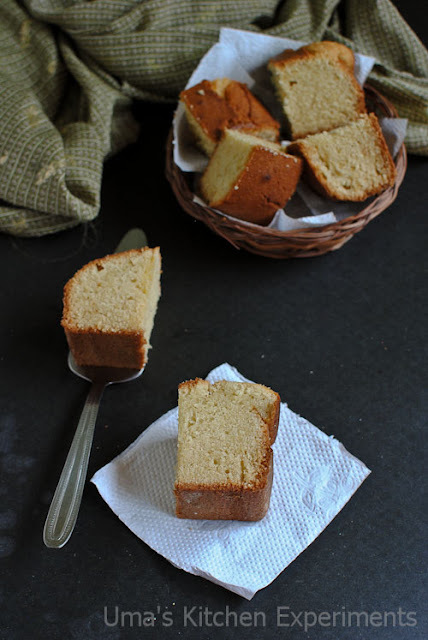 From my side, a pound cake style ghee cake is coming for you all for this new year. 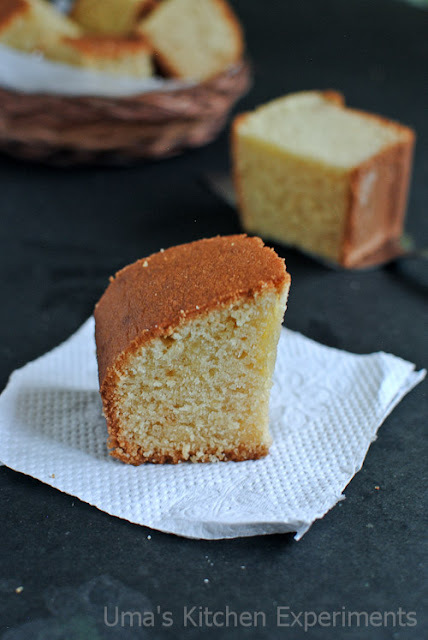 I have bookmarked this cake recipe when Reshmi posted a picture in facebook even before she posted the recipe in her blog. The texture of the cake in her picture was simply pulled me in. Once you start baking, you might love the aroma of the ghee which spreads out in the entire kitchen. Hope you also enjoy this cake like how we enjoyed it! Happy New Year 2013!!! 1) You need 2 small and 1 large mixing bowls for this recipe. 2) Preheat the oven to 375F(175C) for 10-15 minutes. Grease the loaf tin or round or square cake tin with butter or ghee then dust it with flour. Keep it aside. 3) Take first small mixing bowl and sift all purpose flour, baking soda and baking powder. Make sure there are no lumps. Keep it aside. 4) In large mixing bowl, beat together the ghee and powdered sugar until the mixture is creamy and fluffy. Add one egg yellow at a time(Save the egg white in another small mixing bowl) and beat in between after each addition. 5) Add the flour and milk alternately, beginning and ending with flour to this mixture. 6) Now take the second mixing bowl in which we saved egg white. Beat well. Gradually add 1 tablespoon sugar and vanilla essence and continue beating until stiff. 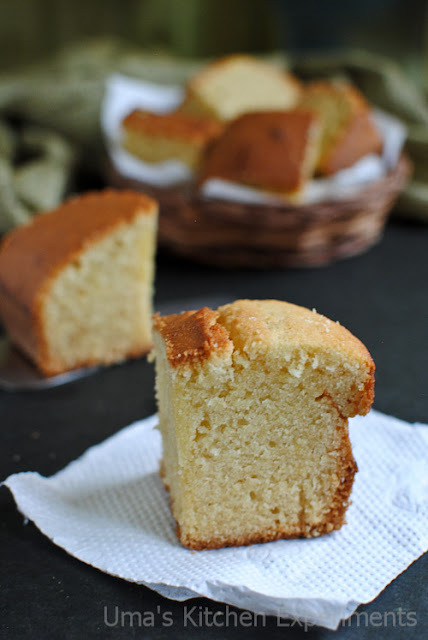 7) Fold this mixture with ghee cake batter in the large bowl. 8) Pour this batter to the prepared cake tin and bake it for 50-55 minutes or tooth pin inserted into it comes out clean. My cake was done in 30 minutes itself with top and bottom heating. 9) Cool it for sometime and transfer it to a wire rack to cool completely. 1) I did all the above preparation using hand whisk(without an electrical beater) and still the outcome of the cake was good. 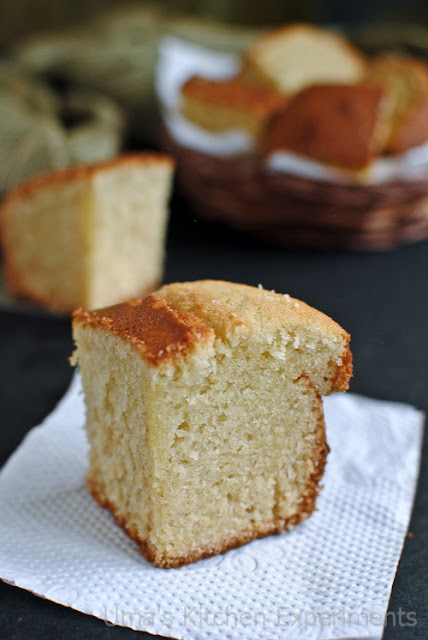 2) Try to use pure ghee for this cake for perfect aroma of the cake. In clarified butter, you might miss this aroma. 3) My cake was perfectly done in just 30 minutes. So watch you oven after 30 minutes while you bake this cake. Cake have come out really good...love it! Happy New Year Wishes to U & Ur Family!! This not only looks good but am usre smells divine as well! Nice cake Uma! Wish You & Your Family A Very Happy New Year! I had so loved the post on Reshmi's blog..you have done a great job too. The name in itself sounds so comforting and warm. Must try it soon. You made a perfect cake without using any blender, delightful really. Wonderful soft cake! I can imagine that ghee aroma.. 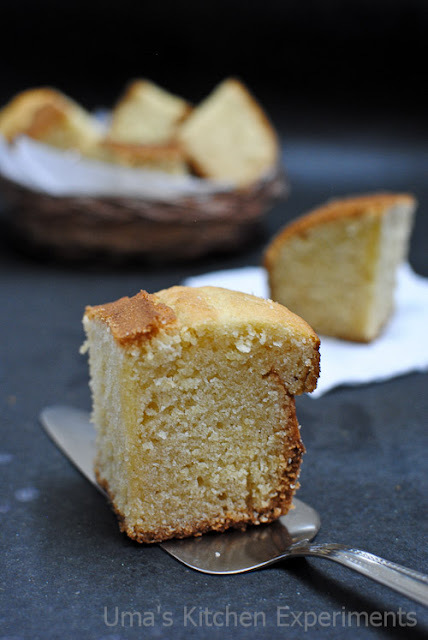 The title "Ghee Cake" itself sounds so tempting. And after looking at these pictures, I can make how scrumptious it will be. Lovely piece of baking. I tried ghee cake yest. I used MILMA ghee. There was no smell of ghee. Do you ise any flavoring agent? Cake turned out to be awesome.. I added some choco chips and it added to the flavor, thanks for the recipe. Dear Anonymous, never tried microwaving. if you have tried, I am glad to know about the results. Hi Uma, the cake came out to be really good. I replaced all purpose floor with whole wheat atta and along with milk, i added some maple syrup to sweeten it little more. Texture came out to be perfect and I could make it with my son (the recipe was so easy to follow) and he totally loved it! thank you!